About a six months ago I started standing at work. There's been a lot of talk on the Net about the benefits of standing desks, and how the sedentary lifestyle of white-collar workers is slowly killing us. I'm not going to weigh in on that debate, but I thought that my experiences might be helpful for others who are considering making a switch to standing, and whether or not to purchase one of those fancy (and expensive) sit/stand desks. This post is also partly in answer to this Simple Programmer Video. I was motivated to start standing at work after a few colleagues tried it out. One person jumped in and has been standing all day since day one. Another person gave up very quickly and returned to just sitting. Still others have purchased "standing desks" that can be raised and lowered (I have a Transformers sound-effect queued up for them). So we've had some different experiences, and also had some unused small tables sitting around… I thought I'd give it a go too. One self observation I've made recently is that, while I will dither at the edges or dip my toes while I'm making a decision to try something new, when I do eventually decide to go in, I'm all in. I would make a terrible poker player. I know this has issues in general and I'm not recommending this approach for others, it's just what I do. I definitely agree with John that if you try to just stand up all day, then you're likely to burn out and give up before you get the strength to be able to tolerate it. 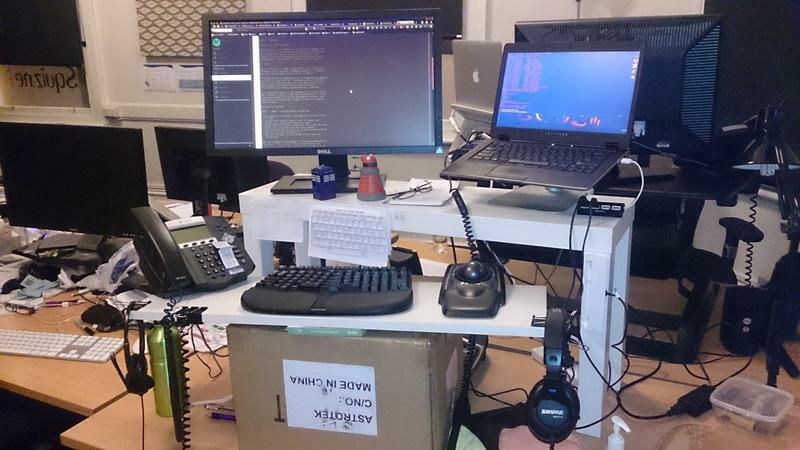 So from this perspective, maybe a sit/stand desk isn't a bad idea? Heh, that cardboard box just happened to be lying around and was the right height. I have a project to make a proper stand for the keyboard, with a negative tilt to save my wrists, but that'll be the topic of another post. Uh, no. I like to pace sometimes when I think, or else get out of the office and walk along the Hobart shore-front, but I use this more as a kind of moving meditation. I can't do focused work and walk at the same time. I can barely dictate to a voice recorder while I walk. I honestly don't think I could work at a treadmill! Which is a bit of a shame because it would be grand to burn kilo-joules while you work, wouldn't it? I find that standing up I am more able to focus than when I sit — I know others say the opposite, but maybe for me it's like standing at attention, or in a "ready" stance in martial arts? I'm up, alert, switched on and I'm doing. Maybe. I'm not convinced that just standing is doing a lot for me, but it's better than sitting I guess. Unless I think about it, my posture is not good though: I slouch and I'm developing a very pronounced paunch. Only actual exercise and diet will address that. I've noticed though that my stamina has improved a lot after the first few months. I feel more alert when I'm standing. I find it easier to get through the 3PM slump. During the first few months I was drained at the end of the day, but now I find it much more bearable, plus on week-ends I have more energy to use around my kids. I'm standing the whole day, except on week-end shifts when I have a 12-hour day; then I'll take the laptop to the break-out room for a change in the afternoon. What was difficult about this switch? What can I do better? Don't underestimate how much physical effort it is just standing all day. It doesn't seem like much, but during the first 3-4 months it's quite hard, especially after 6 hours. I felt it most in my calves, heels and lower back. I think my martial arts training helped me a lot because I can stand on my toes without effort, so I am able to switch between being flat-footed and on my toes through the day. But I would get home at the end of the day and feel physically drained, and also had jumpy legs. Would a sit/stand desk have helped? Probably, but other options exist. I just sit down for lunch. I'm also lucky and I can take the laptop to the break room and still work there off the office WiFi. My old job didn't have WiFi, so I understand that this is still unusual for business offices. Can I keep at it? I believe so. It's no strain for me to stand all day now that I've adjusted to it, and I'm enjoying the benefits.